Aachen, October 2017 – The Institute of Plastics Processing (IKV) in Industry and the Skilled Crafts at RWTH Aachen University will stage its 29th International Colloquium Plastics Technology in Aachen on 28 February and 1 March 2018. The Institute again expects around 800 experts from the global plastics industry to attend the event, which takes place every two years. In 2016, the delegates came from more than 300 companies and 15 nations. All the papers will be translated simultaneously into English. Research at IKV is currently oriented to four main topics: Additive Manufacturing, Plastics Industry 4.0, Lightweight Construction and Integrative Plastics Technology. IKV's scientific assistants will give 36 presentations about the latest research at the Institute on these topics, and well-known experts from industry will give keynote speeches that lead into the Colloquium's 18 sessions. They will also present their positions and will comment on the research results. 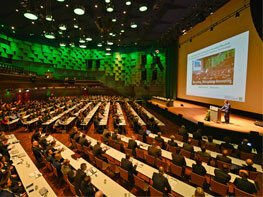 The program will be rounded off by four plenary lectures from industry and research on trends and future developments. The industry trade show in the foyer of the Eurogress Aachen is an integral part of the IKV Colloquium. It offers exhibitors an opportunity to present solutions for the plastics industry and to discuss relevant topics with industry partners. IKV expects exhibitors from along the whole value chain, namely raw material producers, machine manufacturers, converters, processors, suppliers of peripheral equipment and service providers. At "IKV 360°" on the afternoon of the first day, IKV will open its doors to Colloquium delegates and will present its research live in the IKV laboratories and pilot plants. The Institute's research staff will be on hand to talk to the visitors while the machines are up and running. The papers and presentations on the second day of the Colloquium are intended to deepen the practical impressions gained from the demonstrations. "Recruiting. Networking. Innovating" is the motto of the IKV Colloquium. Young upcoming scientists will present their innovative subjects, and it is this presentation of research and innovation throughout the entire field of plastics processing technology that sets the IKV Colloquium apart from other event formats. The keynote and plenary lectures from well-known speakers will enrich the program with their connection to the practical side of the subject and their proximity to industrial application, while the discussions among delegates, speakers, exhibitors and IKV staff will significantly strengthen the Institute's network. Another item on the agenda is the award of the Georg Menges prize, donated by the VDMA, PlasticsEurope and the IKV Sponsors' Association. It will be presented in 2018 for the eleventh time. The award is made to a person who has rendered outstanding service to cooperation between the sciences and economics in the field of plastics processing.